365 Days Of Trash: Wanna Start A Worm Composter? I have a bin that I got from the county of Los Angles smartgardening located at http://ladpw.org/epd/sg/ $50. got me everything I needed. On the info card it mentioned feeding the worms only at one end for a day or two to make the harvesting of the compost easier. They all flock to the food and leave all the other end free for the taking. And the tea...10 to 1 ratio for watering plants and full strength to kill the weeds. I am confused by how many trays I would need. The options are 3, 4, or 5. Is that all of them, or just the processing trays? Isn't the whole thing at the minimum 4 trays? Can you help me out? Am I confusing you? I think you may be confused by the picture, but I understand why now that i look at it. The bottom "tray" is not really one of the trays but the tea collection tray with a spigot. So the pictures show a three tiered tray. I we are a family of four and I have four trays whihc seem to do nicely. It all has to do with how often you fill the trays up. It'll take a few months for the worms t eat everything so you need enough room to expand while that tray is finsihing. Also depends on your eating habits. I'd go with 3 or 4 if i were you and you should be fine. Can this system be set up outdoors? Do the worms survive the winter? 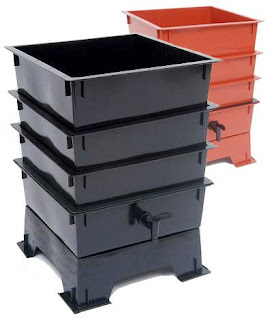 This systems (and most worm systems) is designed for 40-80 degress F, the optimum range for worms. So if you are talking about snow winters, it wouldn't do well. I have friends who have large dirt piles filled with worms and because the worms can go deep, they do ok. I am planning on ordering a Worm Factory 360 today. Any idea if after using for 9 months and having the trays filled up, if I would be able to leave it for a couple of months? Would the worms have enough to eat and/or would smell be a concern? I just found your blog today. You are amazing. Hmmm, a coup;le of months may be pushing it. The two concerns are food and water. You can fill it up with paper and they'll be fine for a month or so. If it's hot water may be a problem. You caould have someone spray them and add paper every couple of weeks? Or you could always set them all free in an area outside and then start again. By the by, if you haven't already bought a unit, drop me an email at dave@sustainabledave.org as I am in the process of starting to sellt hem through the company, just haven't gotten around to putting the info up. Thanks Dave. I'll try to get a neighbor involved by the time I leave. I ordered the unit this morning. Good luck to you with everything. I'll keep checking back for inspiration. Dave your the man! Composting/recyling is great! i have a half basement (half open the other half is crawl space like) If i make a bin on the dirt side , do i need to cover it? i was going to dig a 24" deep and 4'x4' wide hole then line with plastic or nylon , but is this enough airflow for composting? only the top will be open , is this a bad idea? THANKS DAVE! thanks for all your work too! My wife and I are trying to decide about how we want to start worm composting. We are thinking about ordering a 3 or 4 tray system but we live in the north and have snowy cold winters. Can you point out any suggestions for dealing with worm composting in cold climate areas? We would like to be able to leave a worm bin outdoors all year if possible. Also, we have a lot of yard waste, grass clippings, flowers, excess herbs, etc. Can you put this kind of waste in a worm compost bin? Wow, so sorry that took so long. It was caught in the wrong box. IF you are going with a bin system you'll want to keep i out of the elements. I sell them by the way so shoot me an email if you are interested. As far as outside if it's large enough and therefore, generates enough heat, you should be ok. Honestly if you have an outdoor bin, you don't need worms, heat will do the job for you. Grass clippings etc are fine in the bin but only in small quantities. It sounds like a compost pile may be better for you overall. No flies if you keep things covered. Flies are only a problem if you don't keep an eye on the bin. Make sure it can drain and I'd keep it covered to keep the bugs out, otherwise, if you keep a good eye on it, it should work.